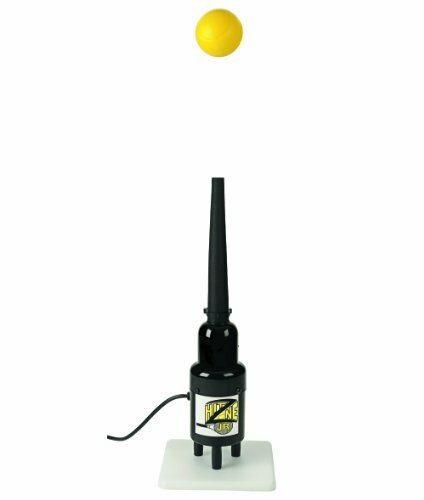 Hit Zone Jr Tennis Air Tee - HZ-T500 - Balls Floats In Mid-Air! You are here: Home / Tennis Store / Training Equipment / Hit Zone Jr Tennis Air Tee – HZ-T500 – Balls Floats In Mid-Air! 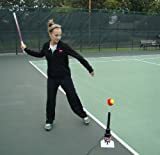 Hit Zone Jr Tennis Air Tee – HZ-T500 – Balls Floats In Mid-Air! The new & exciting Hit Zone Jr for tennis is a great training tool for the 10 & under tennis student! Works great for the big kids too! Your child will love practicing on the Hit Zone Jr. An over sized foam ball or a regulation size foam ball floats in mid-air. 2 Gamma foam tennis training balls come with your order. 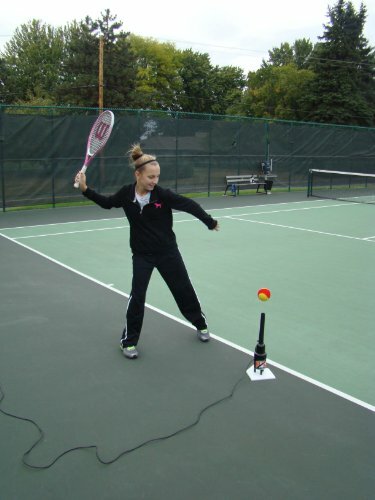 If your child's racquet hits the "tee" - no big deal - it will swing right through it! The Hit Zone tee builds confidence as your child does not need to worry about hitting or knocking over the tee. The Hit Zone develops good training habits! The spinning ball moves around a little, encouraging your child to stay focused on the ball. The ball floating in mid-air is also really cool! Your kid will want to practice and practice. Practice all year round! You can easily set up your Hit Zone and a pop up net in the driveway, yard, or basement. Get an early jump on spring and start practicing all winter long. This unit also works great for T-Ball, Softball, and Baseball training. It is a lot more fun than practicing on a standard tee! 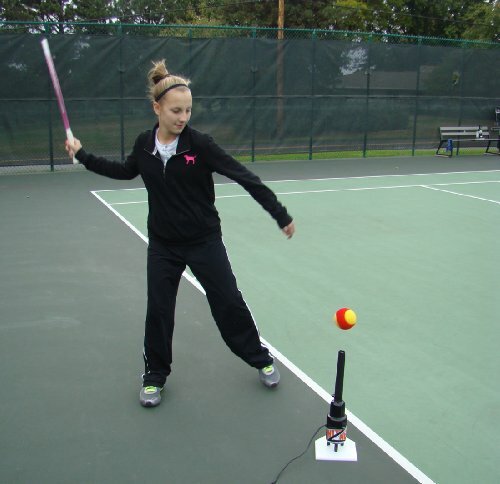 Priced at only $129.50, the Hit Zone JR HZ-T500 for tennis is an affordable way to train at home or at the courts. Get yours today! IMPORTANT: The Hit Zone Jr for tennis comes with 2 Gamma foam training balls. This is the recommended type of ball on this unit. An over sized foam ball also works well. A standard sized tennis ball will not work on JR as it is too heavy, HIT ZONE "STANDARD" Tennis Practice Tee. Body Of Steel Power Unit Assembled with 950 Watt, 1.3 PHP, 120 Volt Motor and 12" Grounded Power Cord. Produces 85 CFM. Includes: TC Plate, 2 Foam Balls, and 1 Fabric Sleeve w/Hose Clamp. Practice Solo! 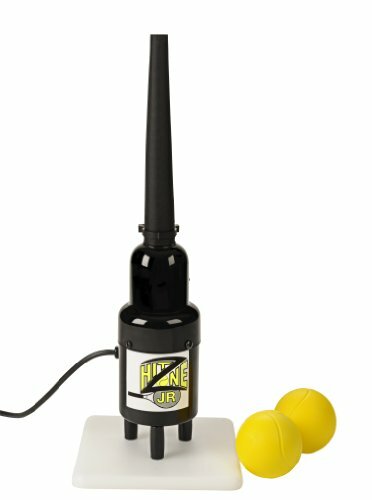 The Hit Zone Jr provides a great training tool to practice year round at home! Set up in your driveway, garage, or basement, and practice year round! A durable fabric sleeve delivers the air! Your racquet will swing right through it! No other tennis training product floats a ball in mid-air. Kids will love practicing on the Hit Zone Jr! The training ball floats and spins in mid-air, creating a fun experience and a unique training aid for your next superstar! 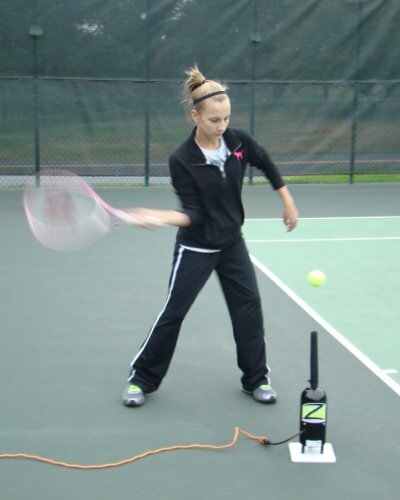 The Hit Zone Jr for tennis provides a great training aid to practice your swing and your foot placement. Light & compact! Easy to take with you to the courts. Operates on a standard 110 outlet.